We at Sneer Campaign take our promises seriously. We promised you fine journalism, enticing story-telling, adequate comics, fancy paper dolls, and a modest dollop of occasional egomania, among other things. Today, we are going to make good on some of these promises by giving you a dazzling paper doll of our very own superstar, Dollissa the doll-sized girl! For you see, it’s her birthday today, and we like to celebrate important holidays whenever they turn up on the calendar. And aside from my own birthday, I can’t think of a birthday more important than this one. Take a look at this doll. You might not know her now, but let me tell you − this is a stunning work of pure accuracy. Our sneering writer owns several of these outfits. And yes, she has three cats that she enjoys lugging around when they let her. And what would Dollissa be without a book, a laptop, a tea, AND a coffee? Unrecognizable is what she’d be! drink coffee, and then another coffee; make sure to have a few! put on the Haircut-cat neckscarf and pick up the other two cats; it never works! It will just have to do the trick until we sit down and figure out how to make those on-page flash games where you can drag clothes onto a doll. 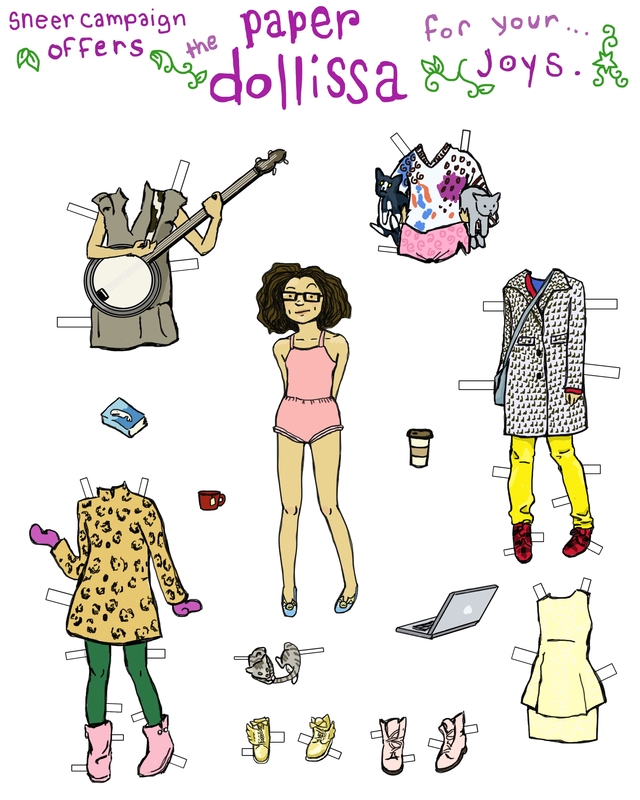 Just kidding, as if that’s at all any fun in comparison to a real paper doll! As usual, click to make the image bigger, but not too much bigger, she’s tiny!